Paying out large amounts of cash for catalytic converters is what’s becoming the industry buzz for Federal Autocat Recycling. We do it because we have a smarter methodology that lets us retrieve more precious metal than what old technology is able to do. And sharing that wealth is what has become the pricing hallmark of doing business with us. We purchase end-of-life metallic and ceramic monolith and bead catalysts from emission control and air pollution control devices. We also accept carbon supported catalyst and other process control catalyst materials. 'Foil' automobile catalytic converters are classified and graded like all other catalysts. Our proprietary grading system defines three major categories, with unit prices for each category and size. Call one of our Purchasing Specialists. Pick-up and transportation will be arranged by us. We will even supply packaging materials, if necessary. Once your converters reach our processing center, they are immediately counted and graded. Based on current market prices for platinum, palladium and rhodium, a purchase offer is calculated, and reported to you. If you approve, a check or wire is forwarded promptly. If you disapprove, your material is returned to you - at our expense. With over 75 years of cumulative experience in the recycling of PGMs, we will evaluate your catalyst material rapidly and return cash for catalytic converters. 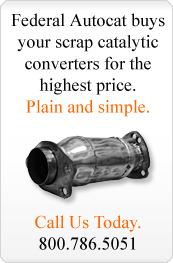 Contact us to learn more about our catalytic converter pricing.